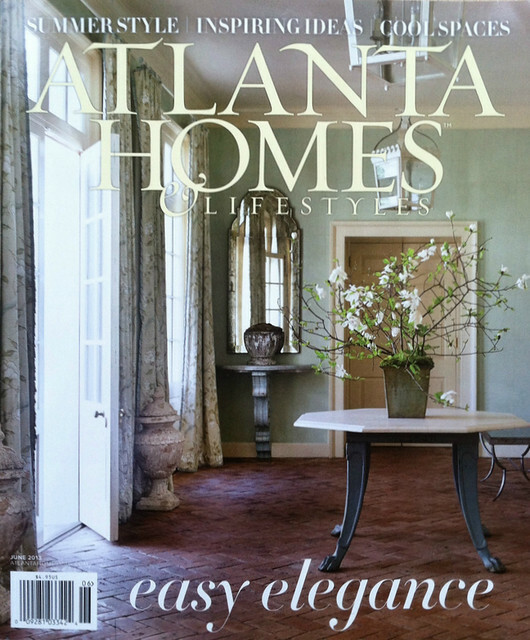 Last week, I had a sneak preview of the new Atlanta Homes & Lifestyles, featuring a house renovated by architect Stan Dixon with interior design work by Liz Williams. Several years ago, I was able to see this house as it was being renovated, and it was gratifying to see how the owners decorated the rooms. As I examined every picture in the article, the kitchen picture (above, photo credit Emily Followill, used with permission) caught my eye. I remember Stan saying how much he likes lamps in kitchens – lamps make a kitchen look and feel so much more like a decorated room. I’m not sure if the deep window space was part of the original house, or if Stan created it during the renovation, but it is certainly the perfect place for a pair of lamps. I wonder if the homeowners turn them on at night? The June Atlanta Homes & Lifestyles is on newsstands now, and there is an Atlanta Homes & Lifestyles iPad app that has all issues available on the iPad for .99, and a year subscription for $7.99. As of the time of this post, the new issue was not yet on the iPad, but it should be soon. Another Stan Dixon project was in Atlanta Homes & Lifestyles last year, and featured lamps in the kitchen. I wonder whether this homeowner actually keeps them there on a day to day basis – they seem to be placed in a prime countertop area (especially given that there is no kitchen island). Interior design by Nancy Warren, architecture by Stan Dixon, photo credit Emily Followill. Photographer Emily Followill shoots some of the most beautiful homes in the Southeast, and this one from her web site is no exception. Note the petite lamps on either side of the range – such a pretty touch. I cam across this picture, attributed to Charlottesville architect Bethany Puopolo. The lamp by the sink, with its dark shade that reflects the dark knobs and light fixture, is a wonderful touch in this kitchen. 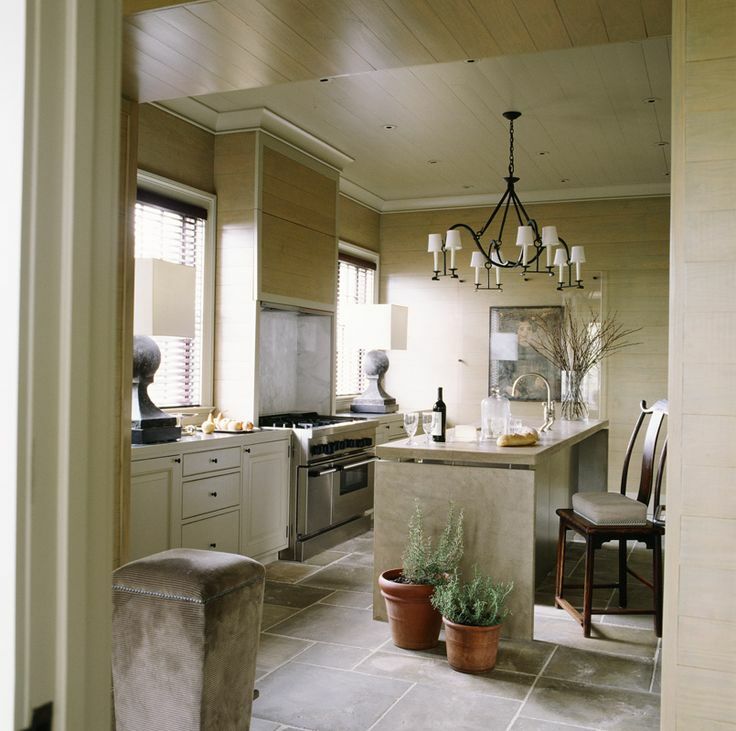 A kitchen in a house designed by Peter Block, interiors by Beth Webb. Note the lamps placed in front of the windows. This style of kitchen lends itself well to lamps, as it is long with ample counter space and no overhead cabinets along the wall. The rest of the house can be seen here; via AH&L, photo credit Erica George Dines. 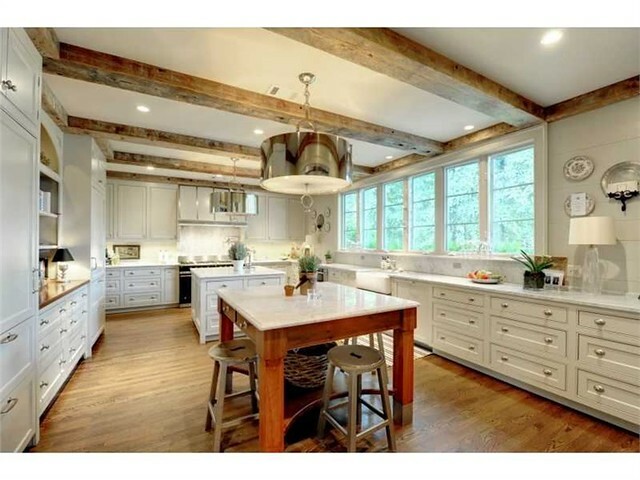 This beautiful kitchen is in a house that is on the market in Atlanta, with architecture by Brad Heppner. Note the glass lamps on the long counter. 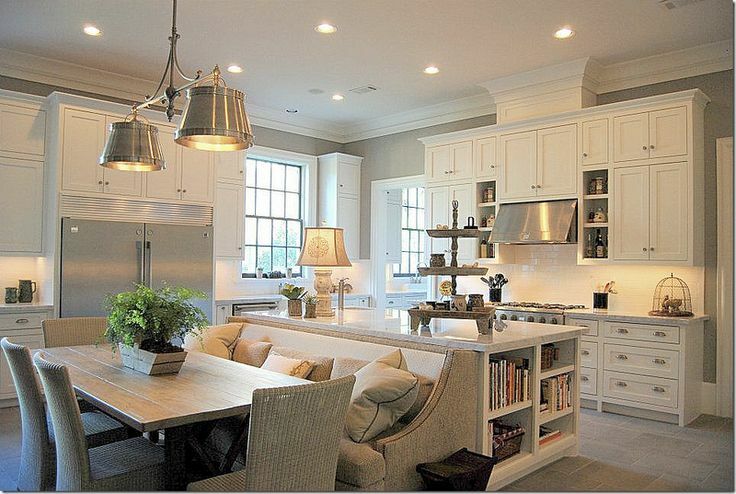 Again, this is a great kitchen for large lamps because of the long counter with no upper cabinets. 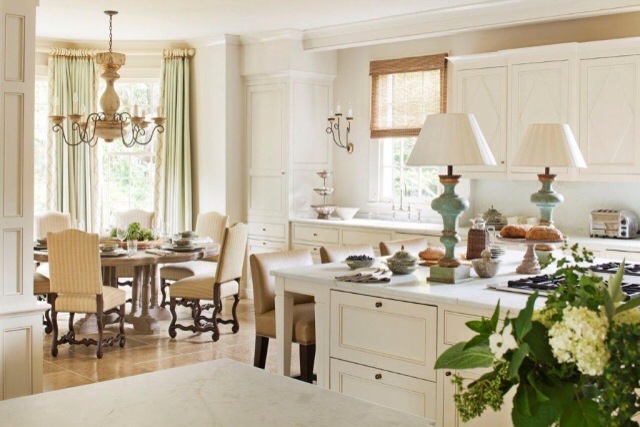 Beautiful kitchen designed by Jackye Lanham features three lamps. I love so many things about this kitchen – the architecture, the tall arched windows that let in so much sunlight, the pewter plates, the lamps – but I always wonder why the stove doesn’t fit in the space! Large statement lamps are a defining feature of this kitchen, with architecture attributed to McAlpine Tankersley. I have seen this light fixture seems in many kitchens (I believe it is by Dennis & Leen) – it is in one of the pictures above too. John Saladino’s kitchen featured in his book ‘Villa’ has several delicate candlestick lamps on both sides of the kitchen. Rumor has it that Ellen DeGeneres and Portia De Rossi have purchased the house recently – see article here. See Saladino’s book on Amazon here. Joni Webb’s kitchen (from Cote de Texas) features a charming small lamp that fits neatly under the cabinets, and provides a nice warm glow that is an alternative to undercabinet lights. Note how she has concealed the cord behind a plate. Another frequently seen place for a lamp is on the island. This beautiful kitchen, with interiors by Michael Siller (via Cote de Texas) has a lamp that is key to the décor of the space. The rest of the house can be seen here. 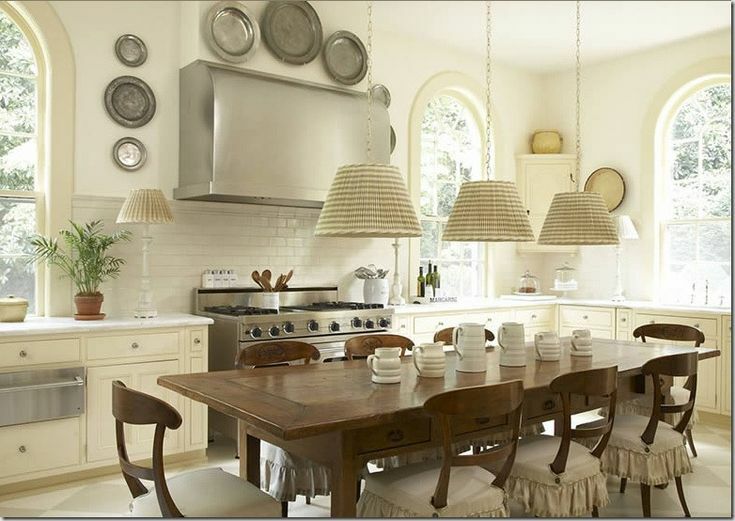 Often a pair of lamps are a feature on an island; another kitchen featured in AH&L, found on Pinterest – not sure who designer is. Note how there is no overhead lighting (although I have heard that magazines often photoshop out those unsightly can lights!). 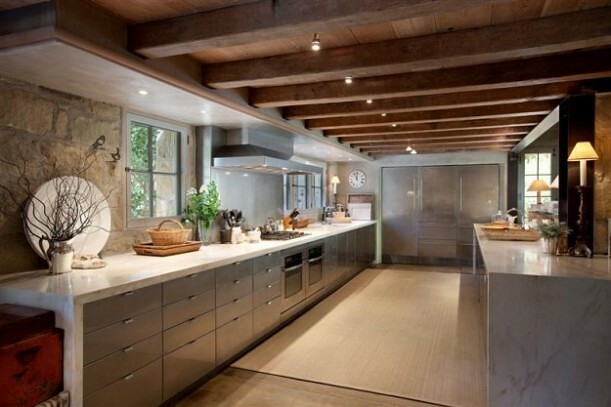 Ina Garten’s kitchen features lamps on the 18 foot long island. Note the novel approach to overhead lighting above the island. I read somewhere that Ina Garten prefers the ambient light of lamps in a kitchen, and also appreciates that they make a kitchen feel more like a room, not a laboratory. This lamp was custom made for her kitchen. 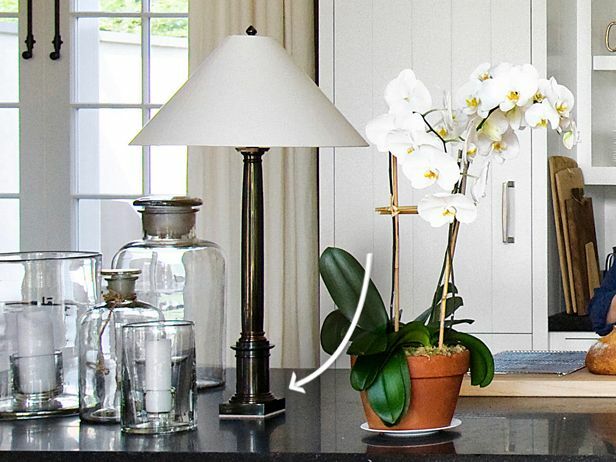 Clearly there are no cords (unless they have been photoshopped out), so I assume that they are built into the counter, with the electrical underneath. After noticing the lamps on Ina Garden’s island, I started noticing other kitchens with this design feature. I suspect that the idea to have lamps on the counter was conceived as the kitchen was created, and there is a hole drilled into the counter for the plug. 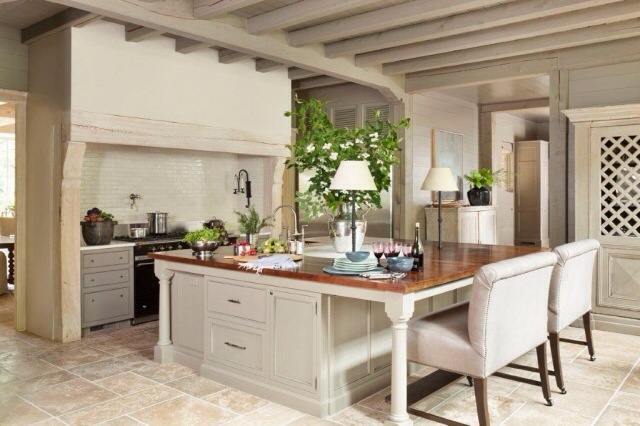 This beautiful kitchen is by Circa Interiors. 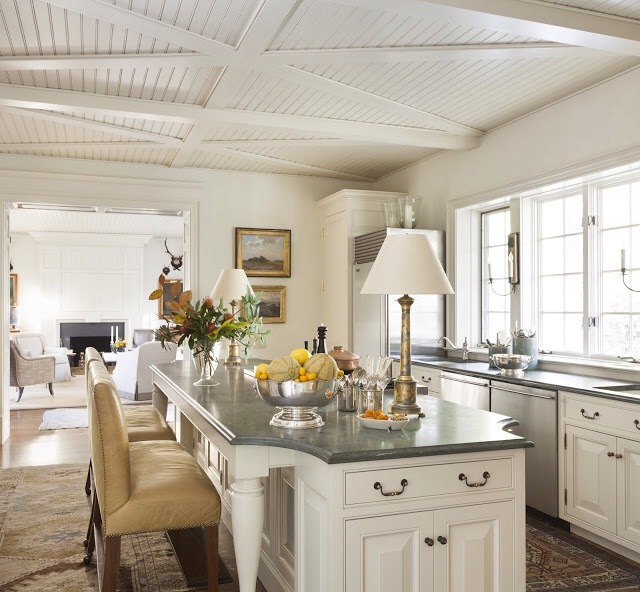 Another beautiful kitchen by Circa Interiors, featuring built in lamps on the island. I really like everything about this kitchen – it looks like an excellent design for a long kitchen space, and I appreciate how the kitchen is situated in relation to the family room beyond – separate yet connected. Note the side by side double dishwashers in front of the windows, and the sinks on either side. I suspect that the countertop above the dishwashers is a key work area for the kitchen, which means that the lamps are probably not taking up prime working space. The lamps on the island are a beautiful and distinctive design feature of the room, and appear to be used instead of overhead lighting (cans or light fixture). Interior design by Circa Interiors. I mentioned the new book by Circa Interiors – The Welcoming House – I read it cover to cover last weekend and thoroughly enjoyed the beautiful houses contained within, as well as the great entertaining and decorating advice. Click here to view on Amazon. 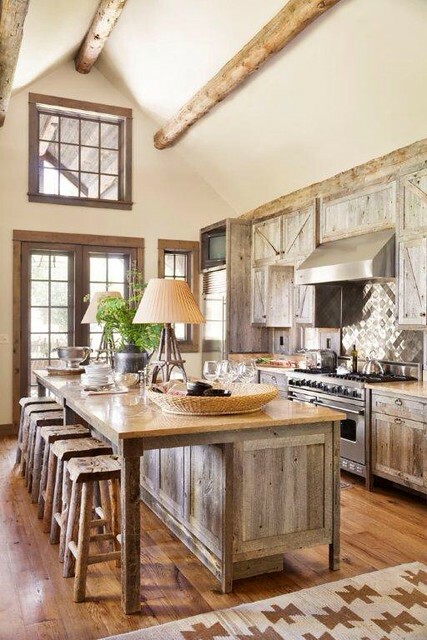 What do you think of lamps in kitchens? Do you have a lamp in your kitchen? I am sold on the idea, if space allows – they are such a charming alternative or addition to can lights or light fixtures if the architecture and space allows for lamps. However, I realize that the architecture and space are a big caveat – putting substantial lamps along a wall in a kitchen requires no overhead cabinets (small lamps are probably better for ambiance rather than a significant light source) and putting lamps on an island requires a large island with ample surface area- the placement is very important, especially since the lamps often must be somewhat built in to avoid pesky cords. yes love this idea -the glow from a lamp just spells 'home'. I'm surprised how many images you found with lamps - I've never noticed it before! I accidentally put a lamp on my kitchen counter once (just temporarily set it there while moving things around) and I was surprised how much I liked it there - it added a warm decorative touch right at eye level. Unfortunately I couldn't keep it there though, as I have very little countertop space and the lamp made it completely nonfunctional. As someone who uses a lamp or two in kitchen, I've found the lighting particularly nice for extra ambiance in evenings. I use one as a night light that is especially nice for those late night kitchen raids ;) It's a nice way to make the most functioning room in a home feel a bit more relaxed I think. However, I don't understand the use of lights in some of the ones shown next to stoves. Aesthetically they look nice but I question the practicality of placing them there. Seems to me they would get in the way with cooking not to mention dirty/grimy quickly. Maybe they were placed there for photo shoot only. All beautiful kitchens - thanks for sharing. don't have one now but will test this weekend ... I always prefer lamp to overhead light. thanks for sharing so much on your blog. i'm terrible at envisioning and with a 1950's ranch that is at the beginning stages of renovating, your thoughts are always a wonderful starting point for me ... thanks! take care and have a great weekend. Lamps add a level of comfort and ambiance to kitchens. 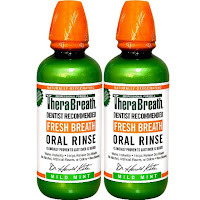 I have always used one but need to rethink and use two. Love this posting! Can you tell me who makes the barley twist bar stools in the second image...or a good knock-off? Lovely photos, but with the exception of Joni's (and maybe the McAlpine/Tankersley one - hard to tell), these are very large kitchens! I have a small lamp in my small kitchen. I, too, wonder about fabric shades so close to the range (seems inevitable that they'd get icky). As much as I generally love everything Bobby McAlpine does, those huge lamps in that kitchen in front of the windows are taking up valuable real estate, and just look wrong to me. The cook would always have to be working around them. I suppose if you drill holes in your countertop for lamps, there's no going back - you'll always have to have them there. Interesting about Ellen and Portia possibly buying John Saladino's house - doesn't seem it would offer her much scope - everything's already perfect! It would also prove true that if a celebrity house is featured in a design mag, then they're getting ready to put it on the market. Dear Holly wonderful kitchens and unique lamps. Yes cord are the bane of my existence. Shallow I know, however they really bother me! I like the ideas of drilling for dropping cords down under the islands etc! I love lamps in kitchens! I just pullled out photos from a recent Traditional Home with lamps on the counter. 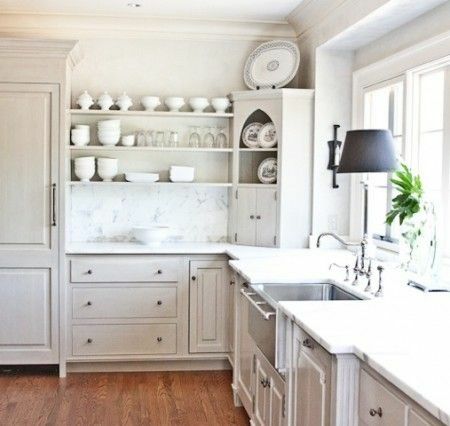 Great post... loved the wide selection of styles of kitchens you showed. Thanks. Any time you can get non-kitchen things into the kitchen, I think you come out ahead. I'd have to place them carefully though, I make big messes in the kitchen. All these have greenery too. Absoutely love lamps in a kitchen. I have two lamps on my counter and can not imagine my kitchen without them, especially in the dark corner. I used a mirrored tray behind a small lamp so it makes it serve double duty. Those kitchens are absolutely divine!! And quite spacious. The lamps add such a charming, intimate touch. Hi Holly...I actually really like it. I have admired many kitchens with lamps and even had a small Staffordshire dog lamp in my own until my sister came and made it known how much she loved it that I gave it to her...lol! I miss it and now have to get another after seeing this post! I think it gives not only pretty soft light but a certain charm and warmth to the kitchen. Wonderful post! Thanks again for including our work on your lovely blog. We're always honored. Today 2 lamps are going into the garden. 1 on the front Bay Terrace, the other at the side on the Tea Olive Terrace. Of course the Conservatory is stuffed with lamps, 24/7 ON ! A long-dead beloved aunt had lamps in her kitchen. Knew as a child I would do the same. What a wonderful topic and great images! I have always had a lamp in my kitchen. Mine is by the sink and has a clear chord and the outlet is right there-so it sort of hides itself. It's the first light I turn on every morning to make coffee and every evening for whoever wanders into the kitchen after dinner. I love the glow combined with the under cabinet lighting for parties- it's magical. You know how I loathe can lighting, especially the large cans and just had all photo shopped out for final pictures of my latest project. 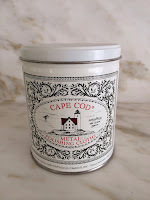 In that particular kitchen I used a tall candle lantern and the homeowners loved it! It amazing what small lamps and candles can do for a kitchen! I love them! thank the Lord there are no can lights! I hope they were just "not an option!" I hope they were not "photoshoppped out! I have faith they will be omitted! love lamps in the kitchen!!! thanks for the shout out!!!!!!!! I love lamps in kitchens and baths. I rarely use my overhead lights in the kitchen. I prefer the lamp, sconce at the stove and under counter lights at the sink.